A couple days ago, I took a rye tasting class led by "LeNell" Smothers (of her eponymous shop, which is easily my favorite liquor store in the world.) We gathered at LeNell's apartment, where we found a dining-room table laid with Riedel tasting glasses, silver expectorant receptacles (somehow it seems indecorous to say "spit cup"...but truth be told, that's what we called 'em), bottles of Italian still spring water, and munchies: crumbled biscuits (and good ones, too), beef jerky, dried apricots and papayas, almonds, dark chocolate, hickory-smoked bacon, and some damn fine cornbread. So, then: on to the whiskeys! We first tasted Isaiah Morgan Rye, which hails from Summersville, West Virginia, not far from my family's ancestral roots in Braxton County. This rye was unique in that it was completely clear and colorless -- I suspect it isn't aged very long, if at all -- and it was far sweeter than I'd expected, with a fruity, light smell and subtle burn. The taste was almost floral, with a hint of pepper that slowly emerged. When cut with some water, this whiskey was actually a little sharper than the others. Next we had some Forty Creek Barrel Select, a Canadian whiskey comprised of corn, barley, and rye whiskeys. That's not corn, barley and rye all cooked together in one "mash bill" or recipe, by the way: three separate whiskeys are made and then blended together. This whiskey had a spicy aroma that built a little over time, and boasted an intense rye flavor, especially when water was added. The finish was spicy and quite tasty. 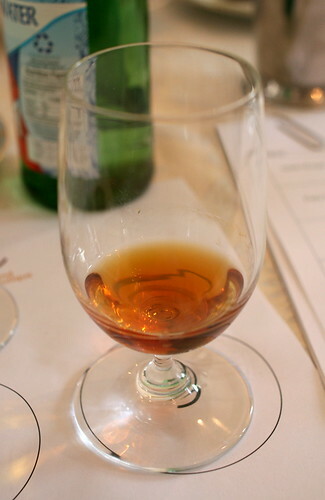 LeNell followed this with a curveball: some Four Roses Single Barrel 100 Proof, which is a bourbon whiskey, not a rye. However, it's made with much more rye in the blend than most bourbons, at 35% rye. This had a honey-golden color similar to the Forty Creek, but slightly darker. I smelled peach and caramel notes, and the whiskey really lit up my mouth -- sweet and burny at first, with a long finish made sweeter by the addition of water. The next one was really special: an extraordinarily rare bottle of I.W. 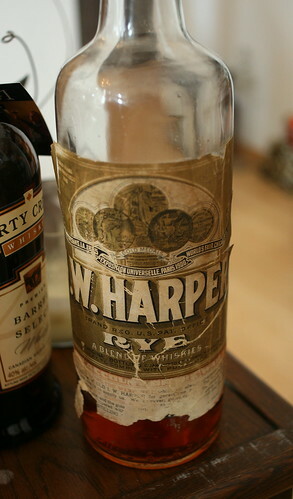 Harper Rye, which hasn't been made for decades. LeNell hasn't been able to track down much information about this stuff, but the whiskey she has was apparently bottled during World War II. The nose was a little musty, but this was surprisingly smooth and sweet, and lighter than I'd expected. There was also a faint hard-to-pin-down flavor that we all debated for a while -- I thought it was like clove oil, and others felt that it was more minty or medicinal. We got contemporary for the next one, which was Old Potrero Single Malt Hotaling's Whiskey from Anchor Distilling Company (yep, they also make Anchor Steam Beer -- and did you know that "steam beer" is a style of beer and not a brand name?) in San Francisco. This was paler than the other examples (save for the colorless Isaiah Morgan mentioned earlier), but had a sharper smell. My scribbled notes say "wallop! ", and this eleven-year-old whiskey certainly did just that. This one also was the subject of some round-the-table discussion (perhaps we were all feeling our oats rye, and hadn't used the spit cups quite as much as we'd been urged to), and we discussed the citrus-y flavor and the grassy/hay-like notes. (I was apparently alone in finding an almost mineral flavor, similar to what you'd find in a Chablis.) The finish was long and tingly, and changed slowly over time. But LeNell saved the best for last -- a barrel sample of her twenty-four year old Red Hook Rye #4, which is her house brand of cask-strength rye. This is the fourth barrel that she's purchased and bottled under the Red Hook Rye name, and it may (sob!) be the last super-aged rye that she'll produce for a while. See, there's a serious rye whiskey shortage going on right now -- one of the very few downsides of the current cocktail renaissance is increased demand for scarce resources -- and they simply didn't make enough whiskey back in '84 to meet the demand in '08. Filtration by chilling can prevent the whiskey from developing a haze when it is cold, but we feel like that haze gives us flavor, and we don't want to take it away. That haze is the evidence of tiny little flavor particles that like to tickle our fancy. And we all know the crew at LeNell's like a little fancy ticklin'. The Red Hook Rye had a lovely dark reddish-amber color, with wine-y, caramel, and butterscotch aromas. The taste? Wow. Peppery (and sweeter when I added water), with spice and vanilla floating around in there. LeNell says she likes this with Capellano Chinato, a vermouth-like fortified wine made from Barolo. Me? I'd take it with anything or nothing at all, just so I could wrap my tongue around this one again. All in all, the rye class was tremendous fun, and I learned quite a bit. The opportunities to taste rare spirits and to be introduced to ones I hadn't tried before (especially without having to buy a whole bottle of something) were great, and hanging out with the lovely and knowledgeable Ms. Smothers was a true delight. Get thee to Brooklyn! Actually -- and I just learned this last night while fact-checking my beer post -- "steam beer" is a registered trademark of Anchor Brewing, and all others must be labelled with the generic "California common beer"
I'm not a huge rye fan, but I've got to say, I'm a bit jealous of your day. I've done something like this with Irish whiskeys and an informal version with Scotch (as we offered to help a Scottish friend "pack" his low bottles for an upcoming move). Wow! Will they have this event again in OCtober, when I am in NYC? ?